This was the first in a series of apparitions that came at a time of great tumult in the world – many of the world’s nations were engaged in the Great War, which would later be named World War I, and in Moscow, Vladimir Lenin was in preparations to set in place the Russian revolution, preparations that would have a very particular impact on the remainder of the 20th century. In the subsequent apparitions, Our Lady asked the children to establish devotion to her Immaculate Heart, make sacrifices for sinners, and to continue to pray the rosary every day for peace in the world. The apparitions to the three children concluded in October 1917, when the Miracle of the Sun occurred. 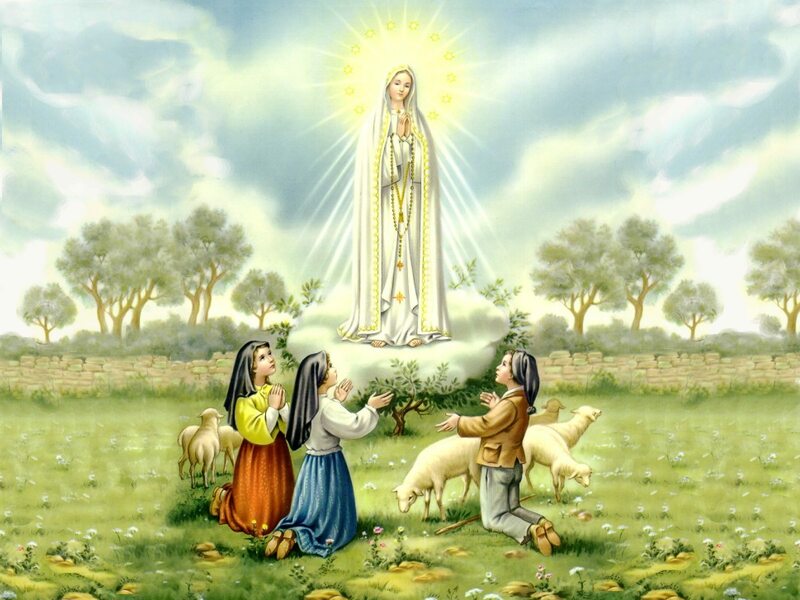 Up to 300,000 had gathered near Fatima and according to many of the witnesses, the sun appeared to spin in the sky (click the link for testimonies from eyewitnesses to the event). This day also marks the 32nd anniversary of the assassination attempt on the life of Blessed Pope John Paul II. John Paul was greeting crowds in St. Peter’s Square when he was shot at close range by Mehmet Ali Agca. The Holy Father was hit four times and one of the bullets missed a major artery in his heart by a fraction of an inch. John Paul credited the Virgin Mary with saving his life, saying, “It was a mother’s hand that guided the bullet’s path.” Later, John Paul presented the bishop of Fatima with the bullet, which to this day remains in the crown of the statue of Our Lady of Fatima. Why not take a moment today to thank Our Lady for her intercession in protecting our Holy Father those many years ago? On Sunday, Pope Francis canonized 802 new saints! Saint Laura, Saint Maria, and the Holy Martyrs of Otranto, pray for us! Viva la Madonna! Long live the Mother of God! In the Catholic Church, the month of May has traditionally been a month to honor the Blessed Virgin Mary, the Mother of God. It is during this month that priests, bishops, and even the Pope himself encourage and highlight the importance of the intercession of the Blessed Virgin Mary in our lives and our need of her prayers. It is clear that Pope Francis has a particular love of the Mother of God and wishes for us to love her too. Just last weekend, he traveled to the largest basilica in Rome dedicated to the Virgin Mary, St. Mary Major, to pray the rosary with the faithful. This is his second visit to this basilica since he was elected pope – the Holy Father came to St. Mary Major the day after his election to ask Our Lady’s intercession for his new pontificate. Mary is a mother who helps Christians grow, face the difficulties of life and use their freedom to make lasting commitments, Pope Francis said. Marking Catholics’ traditional celebration of May as the month of Mary, Pope Francis led the recitation of the rosary May 4 at the Basilica of St. Mary Major. After the service, he went to the steps of the basilica to greet thousands of people who were unable to get inside, and he asked them to say three Hail Marys “for me, because I need it.” He also led the crowd in chanting “Viva la Madonna” (Long live the mother of God). 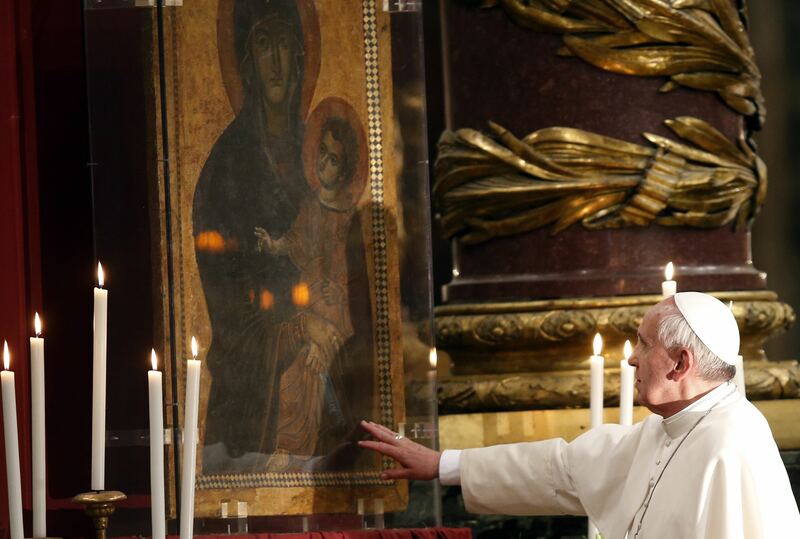 At the beginning and end of the service, Pope Francis venerated the basilica’s famous icon of Mary “Salus Populi Romani” (health of the Roman people, in the above photograph). In a reflection after the recitation of the glorious mysteries of the Rosary, Pope Francis said there are three primary ways in which Mary, as a mother with “great and tender love,” promotes the healthy growth of Christians. On Monday, May 13th, the Feast of Our Lady of Fatima, Pope Francis will consecrate his pontificate to the patronage of the Blessed Virgin Mary. Why not say three Hail Mary’s today, for Pope Francis but also that your love for the Virgin Mary might increase each day? Well, folks, it’s been quite the week. Besides our annual entrance into Lent on Wednesday, Monday also saw the resignation of Pope Benedict XVI – the first pope to do this in centuries. As we look to the end of Benedict’s pontificate, the “interregnum” (literally, between reigns), the conclave, and, finally, the election of a new pope, it promises to be an exciting month for the Church and for the world. The Church awaits word on a conclave date, which is to be determined by the cardinals who will elect the next pope. This is a unique time in the life of the Church. The best thing any of us can do is to pray very much for the Holy Father, the cardinal electors who will participate in the conclave, and the next man who will be Successor to St. Peter, known, at this moment, only to God. If you are interested, join us for a rosary in the St. Paul’s Chapel at 8:40PM on Monday nights, starting on February 18th and ending upon the election of a new pope. Holy Mary, Mother of the Church, pray for us and pray for the Pope! This week we celebrate our third issue of The Catechismal Crusader. We have come a long way and would like to take this opportunity to thank all of our readers for their continued support and generosity. Today we also solemnly celebrate Ash Wednesday, the beginning of the season of Lent. In my expedition through the Catechism I found that while Lent is not discussed in any particular detail, it is most directly related to conversion and penance. As we begin this new Lenten season, I hope these paragraphs help highlight the goal of our fasting, almsgiving, and prayer and better prepare us to celebrate a blessed Easter. Looking for a prayerful Lenten experience? Be sure to check out the Grad/YP Lenten retreat! What was it like to be in the room when the Pope resigned? While this announcement may evoke in us an emotional – perhaps even confused – response, let us trust in Christ and in His Providence and Plan for His Bride, the Church. As we seek to trust in God’s plan, let us especially offer many prayers for our Holy Father, the 117 cardinal electors who will elect a new pope, and for the next successor who will shepherd the Church. R. May the Lord preserve him, and give him life, and make him blessed upon the earth, and deliver him not up to the will of his enemies (Psalm 40:3). Still have questions about the Holy Father’s resignation, or perhaps questions about what comes next? Join us for Mustard Seed, our weekly large group gathering, on Thursday, February 21st for a brief lesson in Conclaves 101. Fr. Eric Sternberg will join us to provide some insight into what is a conclave and what will it look like, as well as provide answers to any questions you might have. My dear friends – at this moment I can only say: pray for me, that I may learn to love the Lord more and more. Pray for me, that I may learn to love his flock more and more – in other words, you, the holy Church, each one of you and all of you together. Pray for me, that I may not flee for fear of the wolves. Let us pray for one another, that the Lord will carry us and that we will learn to carry one another. Another Wednesday calls us to once more bravely embark on our expedition through the Catechism, our crusade to learn more about the faith, that we might become the best Christians we can, saints. We turn our focus this week to the Eucharist, the “source and summit of the Christian life”. In sorting through this section of the Catechism, I found it very difficult to limit the number of paragraphs to include, so please don’t hesitate to read more of this article here. What follows are highlights from the Catechism (sort of like a catechetical Sportcenter without the commentary) . 1392 What material food produces in our bodily life, Holy Communion wonderfully achieves in our spiritual life. Communion with the flesh of the risen Christ, a flesh “given life and giving life through the Holy Spirit,”229 preserves, increases, and renews the life of grace received at Baptism. This growth in Christian life needs the nourishment of Eucharistic Communion, the bread for our pilgrimage until the moment of death, when it will be given to us as viaticum. The gift of our Lord in Eucharistic adoration is a wonderful opportunity to foster a greater love and appreciation for Jesus as the “Bread of Life”. Adoration is offered at St. Paul’s from 8:00-8:55 AM Monday-Friday and 6-7 PM Friday. Just down the street Holy Redeemer offers perpetual adoration all day, every day. The Pope’s Wednesday Audience: How does the Bible describe God? Each Wednesday, thousands flock either to St. Peter’s Square or Pope Paul VI Hall (depending on the weather) for what is called the Pope’s general audience. At this gathering the Holy Father will usually give a short talk, or catechesis, on a matter of faith. Quite often, these talks are part of a larger series focused on a particular matter of faith, morals, or doctrine. For example, early in the pontificate of Blessed Pope John Paul II, his Wednesday audience talks were part of a larger teaching, which today is heralded as the Theology of the Body, God’s design for human sexuality. At today’s General Audience, the Pope continued his catechesis on the Creed, and specifically discussed the Bible’s description of God. If you’re ever been curious as to how Pope Benedict XVI sounds when he speaks in English, check out the clip below!